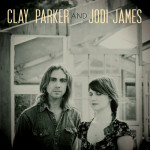 Parker and James are Baton Rouge singer-songwriters whose separate careers have twined for this EP. Written together, and sung in tight harmony, the pair sounds as if they’ve been duetting since childhood. Though built mostly on folk-styled acoustic guitars, the melodies, mood and Paul Buller’s pedal steel give the album a country edge. The EP combines five originals with an arrangement of the traditional “Moonshiner.” The latter has been a staple of the folk scene since the early ‘60s, and Parker and James’ arrangement brings to mind Simon and Garfunkel’s debut album with both their harmonies and the fragility of James’ solo flights. This entry was posted on Saturday, February 27th, 2016 at 7:46 pm	and is filed under CD Review, Free Stream. You can follow any responses to this entry through the RSS 2.0 feed. Both comments and pings are currently closed.